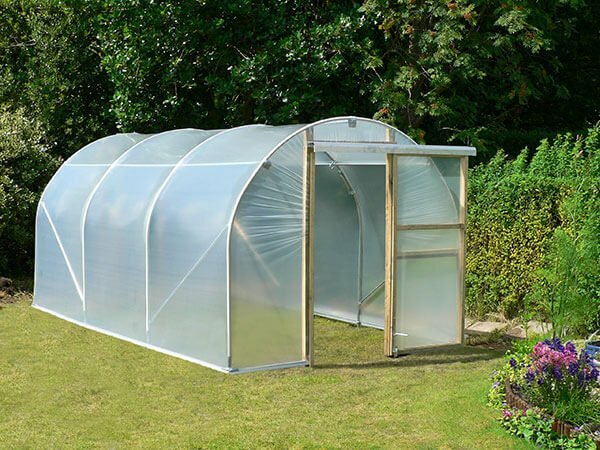 First Tunnels offers a range of different polytunnel covers for your polytunnel. Choosing the right option for you is essential for success in your polytunnel endeavours. Polytunnels are used for a wide range of different uses and determining what you will use your polytunnel for is key to making the right decision about which polythene cover will be best for you. Which Polythene is Best For Your Polytunnel? Designed specifically for the UK where low light levels are common. This film allows 95% light transmission allowing through more of the light spectrum used by plants. It also scatters light entering the tunnel. FOR USE WITH All crops which are frost hardy, where you don’t need to introduce heat, such as overwintered nursery stock, hardy herbaceous perennials, or where the tunnel is only to be used for summer production of vegetables or flower crops. This film has added UV A & UV B filters which dramatically reduce many fungal diseases & condensation. It also contains an Infra-Red additive designed to reduce the speed at which heat dissipates out through the cover – in heated greenhouses 15-20% fuel savings are achieved. FOR USE WITH All crops where heat is important such as bedding/annual plants, propagation houses & overwintered vegetable production. This is our most popular film. This film reduces light transmission to 70% and ultimately the temperature inside the structure. This film is most useful where sun scorch is a problem for growers. It is also suitable for animal husbandry applications and other stock and storage houses where a great build up of heat is not ideal. FOR USE WITH those plants that would normally grow under a shade canopy, species as diverse as camellias and impatiens. This cover allows 65% light transmission. By absorbing much of the red light spectrum, this cover mimics the shade of a forest floor. It is UV stablised. FOR USE WITH: Shade loving plants native to forest floor habitats that benefit from the green light spectrum. This cover allows 0% light transmission. It is green on one side and white on the other and has excellent resistance to UV damage. FOR USE WITH: Livestock structures, mushroom houses & all forms of storage. If you are looking to replace the cover of an existing polytunnel, working out how much polythene you will need is simple. First Tunnels has an easy to use polythene calculator. Just tap in the length and height of your polytunnel, plus the distance over the hoop and the online calculator will work out the rest – in feet or in metres! How Long Does the Polythene Cover Last?